When school’s out, break camps are in! Full-day programs are available for children in Preschool* through Grade 5 throughout the school year. Just because school is on a break doesn’t mean the learning has to stop! 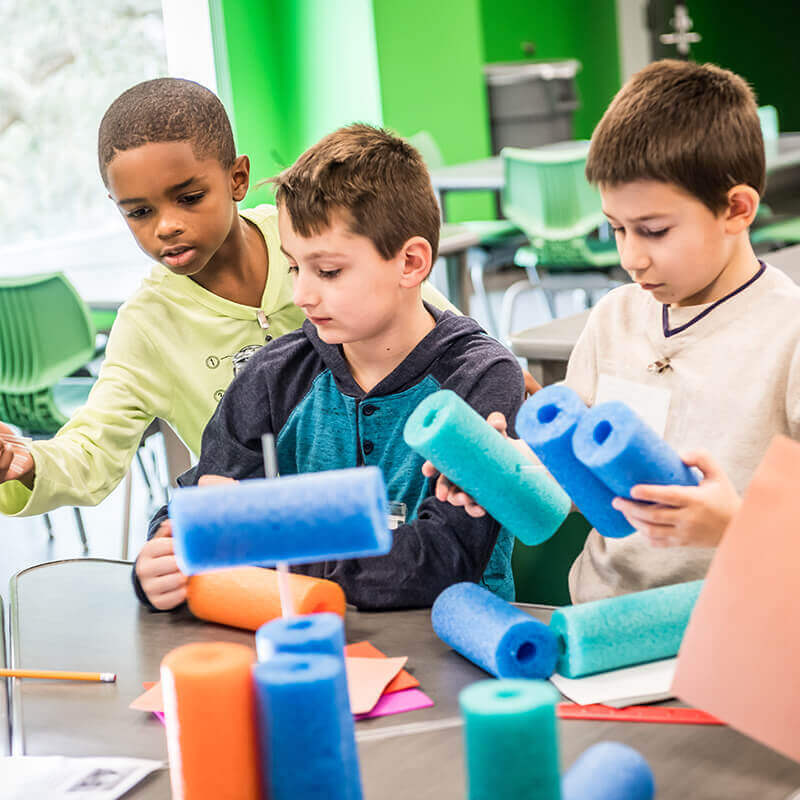 Orlando Science Center hosts break camps when Orange County Public Schools or Seminole County Public Schools are out of session for teacher work days and holiday breaks including winter and spring break. 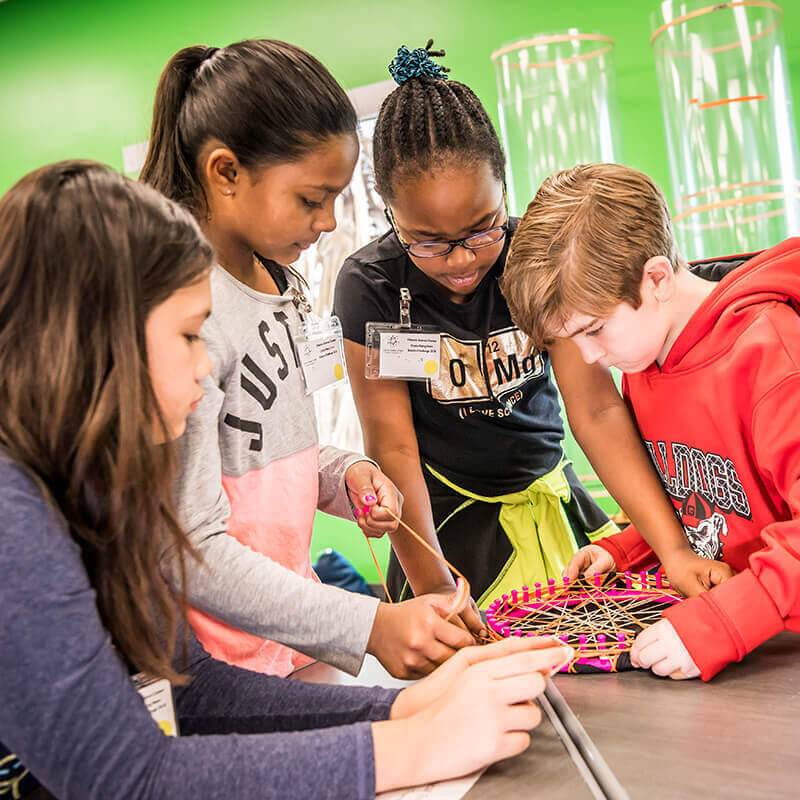 Engaging break camps give children a productive and fun way to spend their time off from school with a chance to learn more about STEM in an exciting, interactive environment. 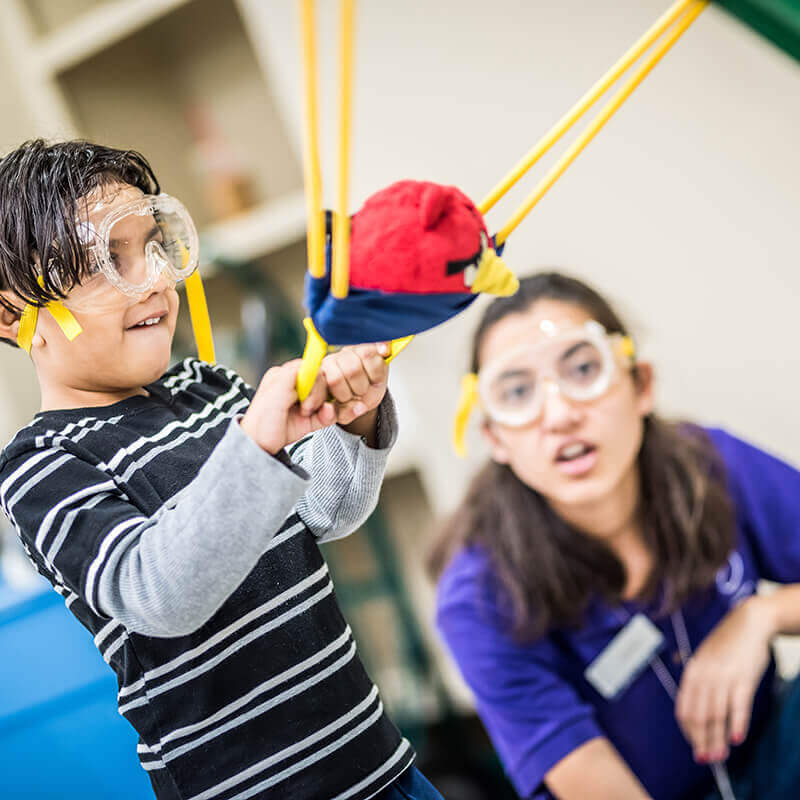 Campers will explore a variety of hands-on science topics in a classroom setting, outdoors, and in our exhibit halls! Break camps run from 9:00 a.m. to 4:00 p.m. Early and late care are provided at no additional cost. 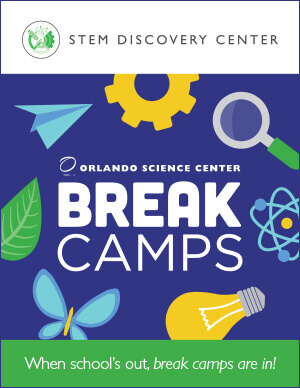 Campers can be dropped off as early as 7:30 a.m. and picked up as late as 6:00 p.m. A late fee applies after 6:00 p.m.
For more information on Break Camps, please call our Reservations Department at 407.514.2112 or email classes@osc.org. *Preschool is a DCF licensed center C09OR0729. Put on your scuba gear and dive deep into the underwater world of the ocean. From jellyfish that glow to underwater volcanoes; you’ll never guess what we’ll find under the sea! Rocks rule! Dig into an underground world of rattling earthquakes, erupting volcanoes and soaring mountains as you investigate why and how the earth changes every day. Are you ready to complete your own Pokédex? Explore the amazing animals and environments that are the inspiration for Pokémon. Master the skills you’ll need to create your own fantastic creatures and go on a fun scavenger hunt to catch ‘em all! Pokémon is a registered trademark of Nintendo, which does not sponsor, authorize or endorse this site. Obsessed with the world of Minecraft? Bring it to life one block at a time while defending your creation from Creepers. We’ll explore gravity and test how the physics of this compelling game compares to the world around us. Minecraft is a registered trademark of MOJANG SYNERGIES AB, which does not sponsor, authorize or endorse this site. Spend your day moving at light speed with activities that will shine some light on lasers and the light spectrum. Experiment with UV rays, observe the light of distant stars and create a laser defense system to protect your base. What do you do when a crocodile has a toothache? How do you check a shark’s pulse? When our furry (and scaly) friends get sick, the veterinarian is there to make them feel better. Spend some time in vet school and get hands-on experience caring for your favorite animals! Using science to make things explode, light up, and change color is awesome, but how does it all work? We’ll explore the physics and chemistry behind explosions, electricity, and new strange chemical creations – safely, of course. How will the 3 Billy Goats Gruff construct a structure to get across the river? What will Jack and the Beanstalk need to grow a bean plant? How do the 3 Little Bears put their things back together after Goldilocks comes for a visit? 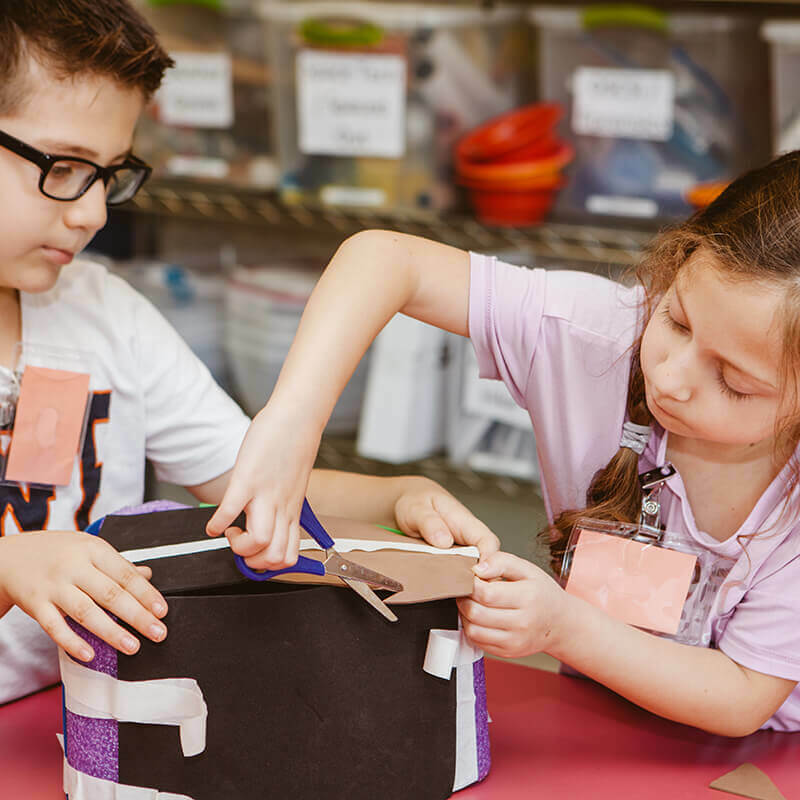 STEM into Fairytales will use our five senses, science, technology, engineering and math along with who, what, where and why questions to get their jobs done. K-2: Who Loves Robots? WEDO! Test your STEM skills by building a chomping alligator and a rocking boat, all from LEGO Education WeDo® robotics! Discover the basic principles of robotics by putting gears, levers and wheels to work. LEGO is a registered trademark of the LEGO Group of companies which does not sponsor, authorize or endorse this site. Bring Robots to life! With LEGO Mindstorm and VEX Robotics, we’ll learn the basics of robotic design and programming, then put our robots to work performing tasks and solving problems. LEGO is a registered trademark of the LEGO Group of companies which does not sponsor, authorize or endorse this site. VEX and VEX Robotics are trademarks or service marks of Innovation First International, Inc. which does not sponsor, authorize or endorse this site. Strap in for a journey to the Sun, Moon and the amazing planets that call our solar system home! Train like an astronaut and plan your mission before you touch down on the rocky red surface of Mars. Are you mad for Space Science? Why are there different constellations visible during different seasons? How does our Sun provide energy for living things on Earth? Why can’t we live on Venus? Come help us explore the answers to these questions and more as we learn about our place in Space. Have you ever wondered why a zebra has stripes? Or why an alligator has so many teeth? Get answers to these questions and more as we step into the role of junior biologists to explore the exciting world of animal adaptations! Travel through time and excavate Florida’s past! Become an anthropologist for the day and learn to survey land, set dig sites, and collect data to uncover the mysteries of history. Remember that artifact belongs in a museum! Calling all budding engineers and architects! How does a structure stay balanced or work with gravity? Can we construct a bridge or building using magnetic tiles, water noodles or popsicle sticks? We will challenge our creative side to construct buildings, bridges and communities for people and animals. Don’t forget your hard hat and safety goggles! What's the difference between a turtle and tortoise? Become a turtle expert and discover their amazing physical adaptations, swimming speed, and powerful shells. At the end of our journey, you will become an ectothermic conservation expert! It's a bird! It's a plane! No, it’s Superhero Science! Harness the power of the elements, master magnetism, and race to super speeds. It’s the science behind super powers! Become a member and save on Break Camps! *Preschool camps are available only for 5-day breaks. Preschool is a DCF licensed center C09OR0729. IMPORTANT: You must have an active membership before proceeding to the registration site. The expiration date must be valid through the date of the camp being purchased. A membership number is required at time of booking. If you purchased a new membership online, see your email confirmation for your temporary membership number.